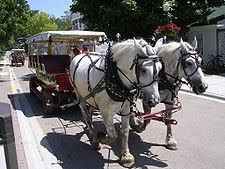 The Grand Hotel embodies all of the beauty and histroy that begins in the Victorian era for Mackinac Island. In a sense, the island is trapped in this time. It clings to the old things and puts them on a pedastle making them great. The hotel is the center of everything beautiful and historic on the island. It’s long, white walls can be seen from the water on the ferry ride to the island. It sits away from the rest of the chaos of the island, amidst green gardens. There are no cars on the island and during my many visits to the island, I have travelled to the old hotel using many modes of transportation. Whether you approach by horse and buggy, bicycle, horseback, or on foot, the elegant porch gleams in the sunlight as the first part of the hotel you see. The hotel is a piece of my history as much as it is the island’s. My great grandfather worked at the hotel and his father before him. My great grandfather proposed to my great grandmother in the old hotel. I still have the ring he proposed her with. The land for the hotel was bought in 1886. During this time the popularity of the island for a summer get away was exploding. Tourists were coming from as far as Chicago to see the scenic beauty of this quiet island. The Grand Hotel was built to cater to the wealthier tourists that came from afar to relax in peace. It was during the construction of the hotel that an untold number of bones were unearthed. Most of the bones were relocated, but it is said that some of these old skeletons still remain beneath the foundation of this luxourious hotel. In 1887 the hotel opened and it was a success from the beginning. During the long summers every room was filled. Of course during the winter, when the bitter Northern Michingan wind freezes the lake and burries the hotel in snow, the hotel was still mostly empty. In the 1890’s, the hotel’s owners proudly announced that they had built the longest porch in the world around the beautiful hotel. In 1895, Mark Twain came for a reading in the Hotel’s grand salon. The Hotel was often host to famous people and a couple of movies were shot at the hotel. The most recent film shot there was made in the 1980’s and stared Christopher Reeves as a love struck playwright. The film was called Somewhere in Time. Despite all this activity, the hotel has continuously been a source of paranormal activity. 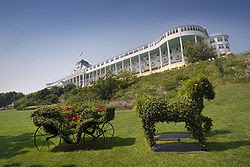 As the hotel expanded, the orignal Fort Mackinac Island cemetery was moved to make room for the horse stables. So the stables now stand on yet another collection of old bones. Those that have worked at the Grand report phantom footsteps and doors opening and shutting. Guests staying at the hotel have reported feeling ill at ease, as if there is something else in the room with them from time to time. The hotel groans at night and, although all old things groan, the noises from this hotel seem loader that they should.